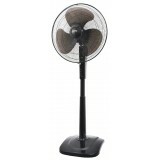 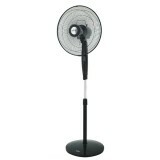 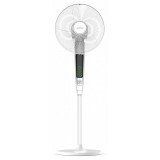 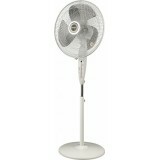 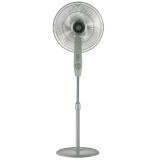 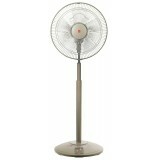 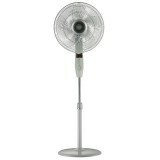 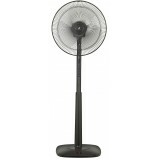 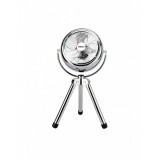 Cornell CFN-E161RC Stand Fan 60W/220-240V/50Hz 40cm/16″ blade size 0.5hr to 7.5hrs timer / preset timer 2 modes (natural & sleep) 3-speed selection Gift Box Dimension : 200 (W) x 555 (L) x 4..
iFan 360˚ is a uniquely constructed fan that is able to oscillate at 360˚ horizontally without limitation to blind spot. 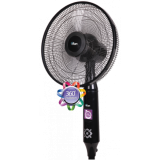 With a multi angle oscillation of 30˚, 60˚, 90˚, 135˚, 180˚, it is able to reach out to every corners of the room. 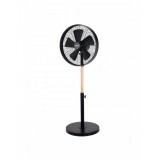 It is sleek and elegant with LCD display and compliments a mo.. 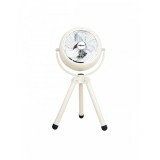 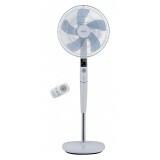 FEATURES Wireless remote control 3-speed and ON/OFF electric switch Rhythm breeze function Height adjustable: 128cm-143cm (50"-56") Transparent plastic blade Colours: Champagne or Titan Grey Timer .. 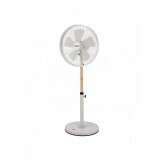 FEATURES Compact motor in slim design 3-speed and electronic ON/OFF switch Rhythm breeze function 4-hour electronic timer Height adjustable: 91cm-105cm (36"-41") Wireless remote control Transparent plastic blade Colour: Premium Gold, Met.. FEATURES 3-speed and ON/OFF electronic switch Rhythm breeze function Height adjustable: 128cm-143cm (50"-56") Transparent plastic blade 6-hour electronic timer Air filter with Super Alleru-buster, Green Tea Catechin and Anti-bacteria Enzyme fu.. 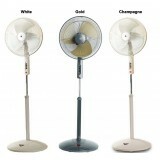 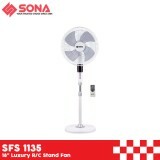 FEATURES 3-speed and ON/OFF push button switch Height adjustable: 129cm-154cm (50¾"- 60½") Metal blade Colours: Gold, White or Champagne ..
Mistral MSF1628W Stand Fan (16”) 3 Speed Button Selection Built-In thermal safety fuse High Quality Fan Blade for strong air delivery Narrow Distanced Fan Guard with Reinforced Ring Voltage: 220~240v 50/60Hz Power: 60w ..
Mistral MSF1678 Stand Fan (16”) 3 Speed Selection 120 minutes Timer ABS Fan Blade Guard Ring with Clip Adjustable Height Power: 55W Voltage: 220~240v 50Hz ..
Mistral MSF1679R Stand Fan (16”) 3 Speed Selection LED Display Mode: Normal, Natural, Sleep, Silent 7.5 Hours Timer 5 ABS Fan Blade Guard Ring with Clip Adjustable Height Power: 55W Voltage: 220~240v 50Hz ..
3 Speed Selection Tripod Based with non- slip rubber feet Tilt Adjustable with Handle Warranty: 2 Year Full Warranty & 8 Years on Fan Motor Only ..
16'' Inverter Stand Fan with Remote ..
Mistral MSF1628WR Remote Stand Fan (16”) 3 Speed Selection 6 Hour Timer Built-In thermal safety fuse High Quality Fan Blade for strong air delivery Power: 60w Voltage: 220~240v 50/60Hz ..
3 Speed Selection Infrared Remote Control 360 Degrees Oscillation Warranty: 2 Year Full & 8 Year on Fan Motor Only Timer Selection - 1H, 2H, 4H, 8H 3 Mode Selection: &n..
3 Speed Selection 5 Pcs Fan Blade Adjustable Height (max 125cm) 75 Degrees Left- Right Oscillation Solid Pile Wood Pole Warrant: 2 Year Full Warranty & 8 Years on Fan Motor Only .. 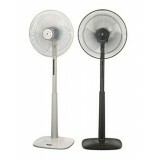 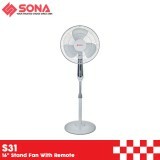 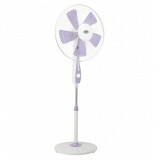 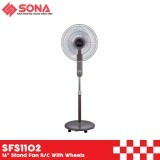 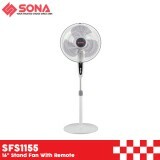 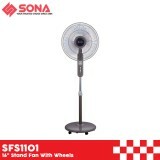 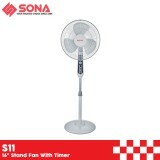 FEATURES 18” Remote Stand Fan 3 Speed Selection 6 Hours timer Built-in safety thermal fuse Adjustable height Height quality fan blade ..
myChoice MC40 Stand Fan (16") Concentrated air flow for optimum cooling and air coverage 3 speed setting, oscillation with 2hr timer Built in thermal protection against overheating Adjustable louver for optimum wind circulation Adjustable ..
Sona S 31 16” Remote Stand Fan 220-240V~ 50/60Hz 55w 2 Years Warranty On Motor Full Copper Coil Motor Twin Motor Remote Control 7.5 Hours Timer Horizontal Oscillation Safety Fuse for Motor Protection 3 Speed Selec..
Sona S11 16" Stand Fan With Remote 220-240V~ 50/60Hz 50W 2 Years Warranty On Motor Full Copper Coil Motor Horizontal Oscillation Safety Fuse for Motor Protection 3 Speed Selection Free neck for up/down adjustment ..
Sona SFS 1135 18” Luxury Remote Stand Fan 220-240V~ 50/60Hz Power: 55Watt 3 Years Warranty On Motor Great Height Adjustment (1.45m) Big LCD Display Screen 3 Speed Choices 7.5 hours timer Wide Grill Ring Normal/ N..
Sona SFS 1153 16" Stand Fan With Timer 220 -240V ~ 55 Watt 2 Years Warranty On Motor ABS Blade – Break Resistance 20mm Full Copper Coil Motor 3 Speed Selection 2 Hours Timer ..
Sona SFS 1155 16" Stand Fan With Remote 220-240V~ 60W 50Hz 2 Years Warranty On Motor 20 mm Full Copper Motor ABS Blade – Breakage Resistance Remote Control 3 Speed Selection 7.5 Hours Timer Rhyt..
Sona SFS1101 16" Fan With Wheels 220-240V~ 50/60Hz 55W 3 Years Warranty On Motor Full Copper Coil Motor Smooth Wheels for Easy Movement 2 Hours Timer Horizontal Oscillation Safety Fuse for Motor Protection 3 Speed Selection F..
Sona SFS1102 16" Remote Stand Fan With Wheels 220-240V~ 50/60Hz 60W 3 Years Warranty On Motor Remote Control for Easy Operation Full Copper Coil Motor Smooth Wheels for Easy Movement 7.5 Hours Timer Horizontal Oscillation ..